The objective of this study is to present an integrated stochastic approach for quantifying the risk of oil spill in marine waters and adjacent coasts. This was achieved via the effective cooperation between the National Technical University of Athens (NTUA) and the Bogazici University (BU) within the framework of a bilateral joint research project. The proposed methodology integrates four models: (1) a physics-based hydrodynamic model (HYM) which computes the spatial distribution of surface water currents as the main driving force for oil transport, (2) an expert-based accident assessment model (AAM) to compute the frequency, location and characteristics of expected oil spills, (3) a physics-based oil spill model (OSM) which computes the propagation and fate of the oil slick, and (4) an expert-based impact assessment model (IAM) to compute the distribution of coastal impact due to oil contamination. The model is applied to two pilot areas: the Saronicos Gulf, Greece and Izmir Bay, Turkey. The flow fields in these areas were determined by the HYM for a large number of wind scenarios, based on which the transport and weathering of an oil slick were computed by the OSM. The most probable oil spill locations were identified by AAM based on the bathymetry, the maritime traffic and the currents. Finally, the IAM was applied to draw Coastal Oil Impact Maps in the regions of interest. Emphasis was placed on the presentation of the risk of oil reaching the coastline. Environmental sensitivity and economic importance were taken into account by assigning index values to all coastal cells. The Zlatibor mountain massif has significantly changed for the past 20 years due to the development of tourism, which has resulted in an increase in water consumption and environmental threats. This area abounds in considerable surface and groundwater resources, which are not utilised adequately. Surface water characterized by lower quality and unstable regimes was utilised for water supply, while groundwater with better qualitative properties was utilised in a small percentage. A number of significant and gradually developing problems are the direct consequence of this concept of water resource utilisation. So far, water supply of central settlements has been based on the concept of the utilisation of surface water from the Zlatibor reservoir which was built in the year 1972, nowadays being filled up above the designed level, while the centralized water supply of other settlements has not been adequately solved generally. Previous research has indicated that this area is characterized by karstic groundwater reserves of regional character, and in most cases they are not adequately utilised, which has opened the possibility of their proper utilisation and the change to a new concept of water management in the area of Zlatibor. A new concept of water management implies the utilisation of karstic water, primarily, to resolve the public water supply issue. In the future, a number of benefits such as: resolving of centralized water supply issues, reduction of surface water pollution, creating opportunities for the utilisation of surface water for other purposes, creating new tourist zones, reduction of environmental pollution, improvement of the general welfare of the population, etc., will be achieved by this concept. From the aforesaid, it can be concluded that a number of interconnected and integrated benefits will be gained by full implementation of the new concept of karst water utilisation. The application of the concept designed in this way, ultimately implies the establishment of an integrated management of all karst water in the area of Zlatibor. 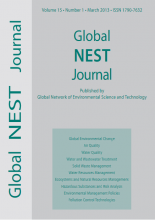 In order to achieve this goal, it is necessary, primarily, to solve the problem of adequate public water supply by karstic groundwater, which implies the establishment of integrated karstic water management in this area, and that is the focus of this paper. Cu2O photocatalyst is synthesized by solvothermal method. Morphology and structure of Cu2O photocatalyst are analyzed by SEM, XRD and N2 sorption technique. The catalytic performances and reaction kinetics of Cu2O photocatalyst for the degradation of methylene blue (MB) are investigated. The toxicity effect of Cu2O photocatalyst on yeast Saccharomyces cerevisiae is also studied. The results show pure Cu2O photocatalyst with truncated octahedron morphology is obtained and demonstrates good potential on degradation of MB. The degree of MB degradation is improved significantly in the presence of H2O2, and the optimum H2O2 concentration is 1.3 wt%. The degradation rate constant decreases as the initial MB concentration increases, and the degradation reaction can be represented by pseudo-first-order kinetics model. Cu2O photocatalyst shows a good reusability and slight limited growth rate of Saccharomyces cerevisiae, suggesting it can serve as an effective and recyclable photocatalyst. It is well known that chlorine and its compounds, traditionally utilized for water and wastewater disinfection, react with some organic matter to form undesirable by-products, hazardous to human health, known as Disinfection By-Products (DBPs). In many countries very stringent limits for chlorination by-products such as trihalomethanes were set for wastewater reuse. Accordingly, the use of different oxidation/disinfection systems should be evaluated as possible alternative to chlorine. Ultrasound (US) was recently found to be effective for this purpose. Aim of this work is to review main US disinfection studies, pointing out ultrasound mechanisms as well as its effects in terms of different bacteria inactivation (Total coliform, Escherichia coli, Pseudomonas aeruginosa, Bacillus subtilis, Saccharomyces cerevisiae, Klebsiella pneumonia) at both laboratory scale and pilot-scale. To this end, several experimental results were discussed and both focal interest points and encountered problems were summarized. Moreover the intensification of cavitation phenomena by combined oxidation processes was overviewed and main advantages and disadvantages were pointed out, in order to address future research and promote efficient large scale operations. Hydrogen peroxide consumption is known to be one of the key parameters of the photo-Fenton process responsible for its high operating costs. The purpose of this study was to find out whether adding dissolved oxygen to the reaction medium in a continuous stream of pure oxygen or air with different H2O2 dosage strategies could improve the Dorfman mechanism, generating secondary oxidation species that could boost mineralization, and consequently, diminish H2O2 consumption. Experiments confirmed less efficient COD elimination. Additional DO slightly increased H2O2 consumption, as it initiated a series of reactions generating hydroxyl radical scavengers and H2O2 self-decomposition slowing down the reaction. At the same time, the study highlighted that automatic H2O2 dosing based on DO setpoints would be a highly attractive control option, however, more detailed studies on the initial amount of hydrogen peroxide and dosing rates must be undertaken. The construction of large infrastructure projects such as highways, railroads, landfills, airports, harbours offers great social-economic opportunities for the development of a region; it is also mainly responsible for the deterioration of natural environment in the greater areas where these projects are located. The goal of environmental impact assessment (EIA) that is carried out before the construction of such a project is to propose measures and actions that will limit negative environmental impacts during its construction and operation phases. The common perception is that large scale infrastructure projects can only damage natural environment even though very strict environmental requirements are imposed by the Authorities. This was not the case in Eleonas Attikis region in Greece where METRO facilities were built. During the construction phase, hazardous solid wastes were found buried in the urban area where METRO facilities (station, tunnel and depot) were located, raising serious environmental issues in natural and human environment in the region. The protection and restoration of environment in an uncontrolled waste dumpsite require accurate estimation of subsurface pollution extent and intensity. The scope of the present analysis is to map the contamination in the aquifer of Eleona Attikis where METRO facilities (station, tunnel and depot) were built. Numerical modelling approaches were used to estimate environmental impacts of this project to soil and water resources in the greater region. The results have shown that the removal of buried solid wastes to construct METRO station and depot was crucial in order to eliminate negative impacts in soil and subsurface water resources. An impact assessment of hazardous solid wastes buried for many years in the aquifer was also performed. The findings of this analysis proved that the implementation of a large infrastructure project such as the one in Eleona Attikis Greece was environmentally beneficial for the region. This study examines the implication of a market-based system to allocate water regionally in one of the most intensively irrigated areas of Greece. The proposed approach combines elements from administrative allocation and tradable water rights in order to assess several water supply scenarios under growing water scarcity conditions. In this framework, irrigation water demand functions were derived by means of an optimization model that maximizes the expected annual net benefits from water use in agriculture. Then, an inter-district water market model is developed to compute the most effective water allocation at the basin-level. An institutional reform is suggested, that is linked with the creation of effective water users’ associations. The aim of this reform is to achieve a functioning and low-cost trading system at the basin level. The results show that significant volumes of water would be traded under various deficit scenarios, mainly due to the spatial heterogeneity in water use and availability. Recently, the fate of emerging compounds in environmentally relevant samples has attracted considerable attention. Solar semiconductor photocatalysis may offer an appealing methodology to treat such contaminants. At the same time the use of solar photocatalysis for water and wastewater disinfection is a topic well-documented in the literature. In this respect, the simultaneous degradation of synthetic estrogen 17α-ethynylestradiol (EE2) and Escherichia coli removal employing simulated solar radiation and TiO2 as the photocatalyst was investigated. In general, the more complex the water matrix is the slower E. coli removal becomes, while the presence of E. coli in the reaction mixture did not obstruct EE2 removal. Although EE2 removal occurred relatively fast, overall estrogenic activity was only partially removed. This implies that other species inherently present in the effluent and/or some photocatalytic transformation by-products may be proportionately more estrogenic than EE2. Overall, the use of solar radiation can constitute an advantageous treatment strategy for the simultaneous removal of micro-pollutants and pathogens from secondary treated effluent. (75-175 mg l-1). Pseudo-first and pseudo-second order models were fitted with the experimental data. The results revealed that nitrogen-doped TiO2 synthesized at 400 °C presented the more adequate characteristics for adsorption purposes, such as specific surface area of 151 m2 g-1. The adsorption kinetics agreed with the pseudo-second order model, at initial dye concentrations from 75 to 175 mg l-1. The maximum adsorption capacity predicted by the pseudo-second order model was 138.3 mg g-1, and was obtained using nitrogen-doped TiO2 synthesized at 400 °C. In summary, these results revealed that nitrogen-doped TiO2 is a good material for the removal Direct Black 38 from aqueous solutions by adsorption.